New York City is known for its many great restaurants but there are times when you can’t find anywhere interesting to eat. If you find yourself faced with an empty stomach at the Empire State Building or shopping nearby at Herald Square, instead of an upscale steakhouse or a generic deli or café, check out Korean Way. Korean Way is the stretch of 32nd Street between Broadway and 5th Avenue that houses more than 100 Korean-owned businesses. Among these are some of the best lunch places in the area. Seoul Garden – located at 34 W. 32 Street on the 2nd floor – is a popular lunch spot. The vegetarian bibimbop with kimchi (spicy cabbage) or tofu over rice served in a sizzling hot stone bowl is delicious but my favorite part of the meal is the banchan (side dishes) that come with it. These are sometimes adventurous (fish skins) but most often they include spicy pickled vegetables, sautéed tofu and soy beans. 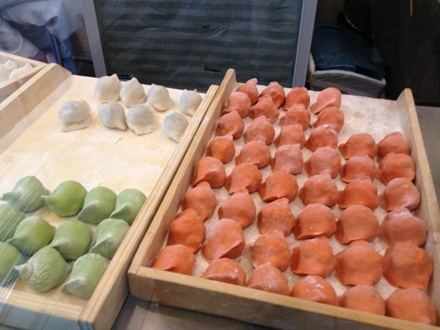 At Mandoo Bar – 2 West 32 Street – watch them make fresh vegetable or meat dumplings through the front window. This clean and cozy little lunch place has a selection of fried or healthy steamed dumplings as well as noodles, soups and rice dishes. It gets super busy between 12-1pm so try to go around those times. The Food Gallery 32 – 11 W 32nd Street – is essentially a food court but it has a good selection of traditional Korean, Thai and some creative and tasty sushi. Bonchon Fried Chicken – 325 5th Avenue and Kyochon Chicken – 319 5th Avenue (at 32nd) – if you have never had Korean chicken wings, you don’t know what you are missing. They are crispy, sweet and spicy goodness (Kyochon’s are especially spicy). 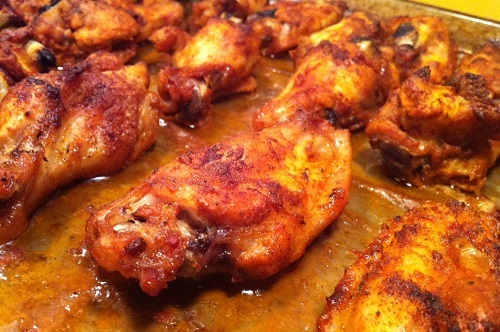 I have dreams about these wings. There are also non-spicy options for kids like honey garlic chicken strips and rice bowls. For Korean BBQ (yummy marinated beef, chicken or pork prepared at a diner’s table on gas or charcoal grills built into the table itself), Kum Gang San – 49 W 32nd Street – is one of several restaurants that serve up a good BBQ. It’s large open restaurant that is open 24 hours. Don’t let the fake rock interior and waterfall put you off. At night, musicians play traditional Korean harp music, or piano. For dessert, the Korean Way also has several bakeries with Korean and standard French pastries and cakes. Bizarrely, these have French names and the décor has a Parisian patisserie feel. They also have sandwiches and a full selection of coffees and bubble teas for an anytime of the day snack.